Hronský Beňadik village lies between southern parts of mountain area Pohronský Inovec and Štiavnické vrchy and river Hron. It is one of the historical crossroads connecting Pohronie with Ponitrie, the southern region with western area. It is rich in high-quality soil, wineyards and rare metal materials. Its geographical position was very important in the past. 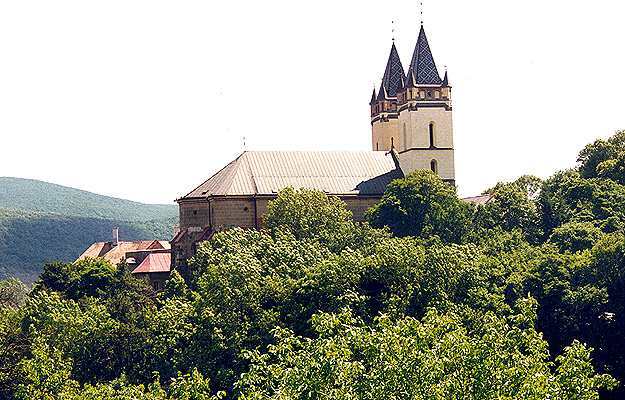 The first writen reference comes from 1075 when the main church was built by King Gejza I. He also donated large quantity of fertile land, wineqards, meadows, rivers and ponds to this area. There is a proof that the first inhabitans of this area lived there in antiguity. Lots of stone tools and primitive ceramics were found there too. There is an important archaeological riches. Benediktínsky monastery and church – it is one of the most interesting architectural relics in Slovakia. It has got a significant cultural and historical value as well as rich history. In 1970 it became the national cultural relic. It consists of impressive gothic building and other grand houses. It was built in a number of stages. The organ in the church comes from 1714 and is one of the most valuable organs in Slovakia. The monastery complex was repaired and reconstructed in the late 19th century which has contributed to its beauty and historical value. For that reason it is usually called „The Pearl of Pohronie region“. In September 16th and 17th 2000 we all will be celebrating 925th anniversary of its first writen reference. In 1713, a small chapel was built there to remind people time of plague illness. Since 1912 the regular pilgrimages are organised here.